Most published texts fall short on detail when it comes to the important subject of making up canvasses. Because tailoring and cutting cannot be truly separated from one another, cutters sometimes almost begrudgingly add a little appendage at the end of their writing and fleetingly add that the canvas is one of the biggest determinants of how a coat looks. What they rarely admit is that it is to a coat what the engine is to a car. It is precisely here that the skills of cutter and tailor become so intimately intertwined as to become truly inseparable. The way the shape of the canvas can be achieved includes the insertion of cuts as well as by ironwork. Chest canvas responds poorly to the iron, whereas body canvas is easier to shape this way. Opinions on the right way to cut the canvas vary, and a wide range of opinions are all given full voice in this thread. Many of the opinions expressed here are in flagrant contradiction to one another. Readers are urged to experiment and to come to their own conclusions. The canvas pattern is based on the coat pattern. The width of the shoulder is divided into three. The first cut to produce the hollowing of the shoulder is placed 1/3 of the way in. All other measures shown are in centimetres. The shoulder support and chest piece are basted in ensuring that the extra length at the front of armscye is preserved. A cut is held open at the neck on the chest piece. Another cut is made lower down in the chest to produce chest effect. To see how the current version of this canvas plan differs from this please purchase the current HAKA book from the Mueller & Sons website. These older cuts are NOT recommended for use today, but are the forerunners of modern plans that remain usable. These early plans are remarkable not only for the extreme size of the cuts, but also for the proliferation of sheer number of cuts placed in the canvas. These cuts are also very close together - something that should be avoided on modern canvasses. There are also interesting variations on modern conventional cuts. For example cuts 1 and 2 on Abb 194-195 tend to introduce such crookedness into the cut that the front of armscye has to be given an extra stretch to compensate for this. This will throw even further length to the area of the shoulder bone. This is to say that the degree of shaping in these canvas plans is also quite extreme by modern standards. 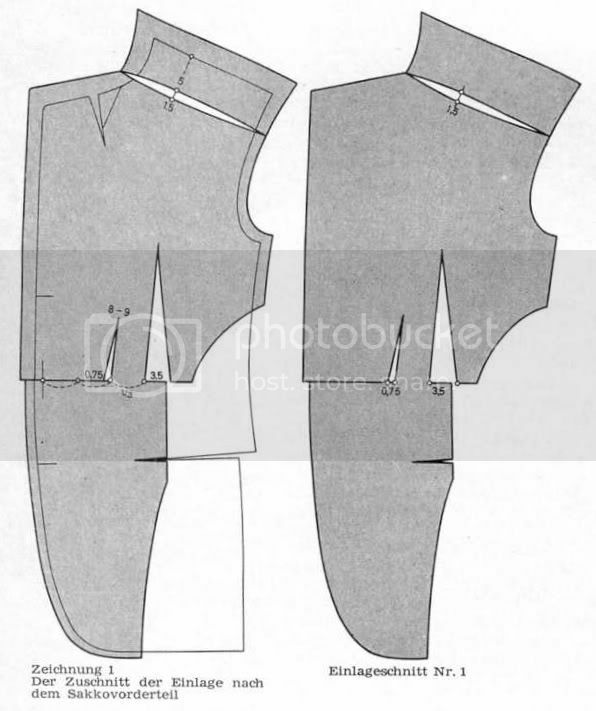 Despite these concerns, variations of these plans are still considered usable by many modern tailors. 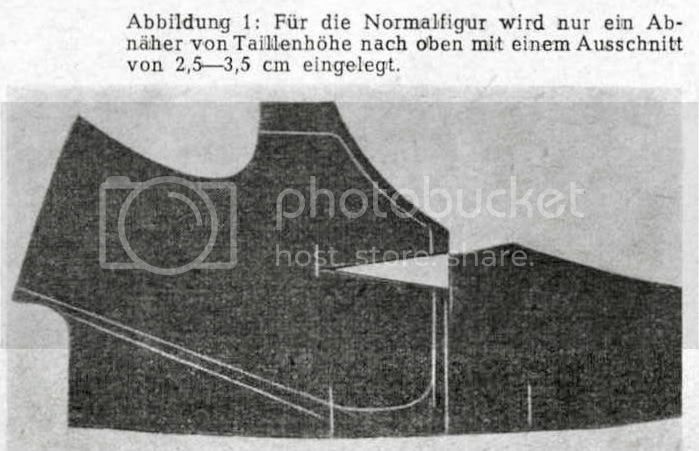 For example, the modern Rundschau plan is just a derivative of Canvas Pattern I (top diagram). The only difference is that the 1930s version is designed so as to throw up extra length at the front of neck as it is closed, something that adds a lot of extra hollowing of the shoulder. When a canvas plan throws length like this to the neck care should be taken to keep the neck short here on the coat to avoid the collar lifting off the neck. Of further interest is the way that the canvas is extended much further around the base of armscye than is usual today, where the fashion today is more for lightness and softness. 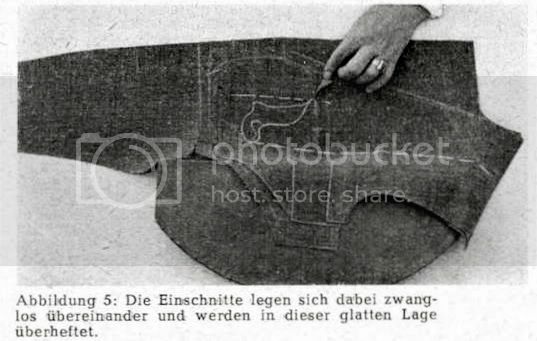 Classical German canvas plans tend to be quite complex in terms of both the size and number of cuts introduced. Many will find them too interventionist and object that the cuts are too big, and risk showing from the outside of the coat. Others will object that the size and number of cuts weakens the canvas, especially given the fact that modern canvasses are woven much lighter than in the past. Readers are invited to experiment and make up their own minds. Trial canvasses should always be made up prior to installation. 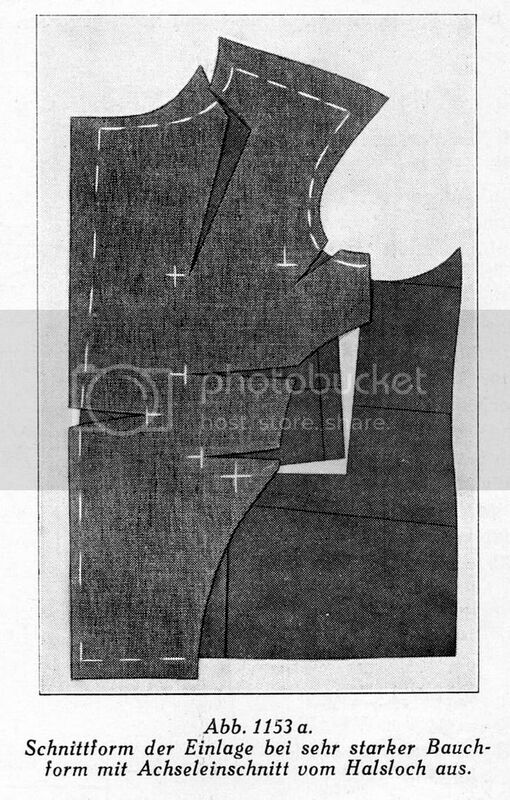 The extension of the canvas further around the base of armscye helps to conceal fairly large cuts underneath the arm, but such cuts should still be covered with strips of fusible to avoid them showing from the right side of the coat. When introducing these types of cuts into modern canvas care needs to be taken to keep the cuts as far apart as practical (at least 5 cm and preferably 7 cm apart) in order to retain as much spring in the canvas as practical. The length and number of cuts should also be limited. The next discussion comes from a circa 1950-60s Rundschau article that was previously posted by Schneidergott, and shows the modern descendants of the above variations. The modern canvas plan recommended by Rundschau since around the 1970s is Canvas Number II. Canvas Number IV was recommended by ASZ authors in the 1960s, and a similar plan was favoured by Czujewiecz around this period. A canvas plan with a cut-on shoulder section (often the shoulder section is cut on the bias), is still favoured by some famous Parisian houses. 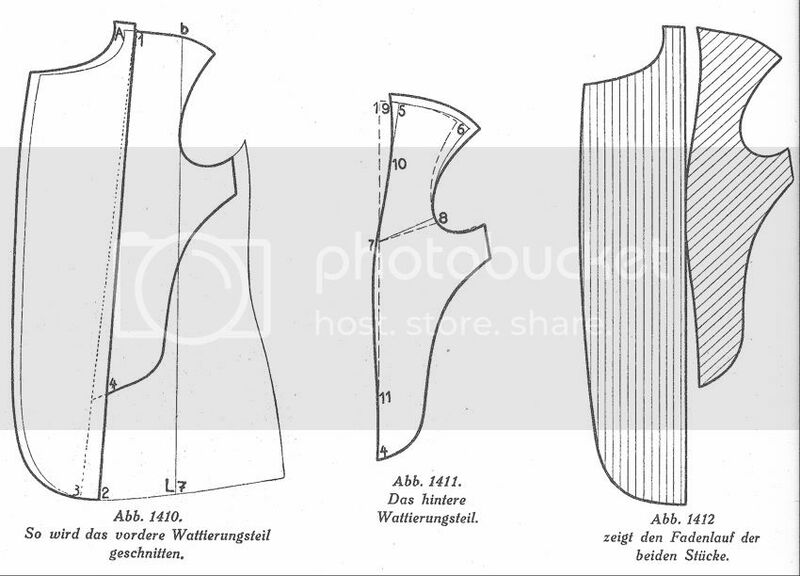 Canvas Number III was recommended by Rundschau in the early 1970s as the optimal plan for a concave shoulder. The authors of the article say that the fashionable lounge coat of the period had a closer cut with waist suppression and a straighter, modestly hollowed out shoulder. They recommend that the canvas follow and accentuate the shape of the currently fashionable cut of the lounge. This is something that remains true today. The canvas has a large dart at the waist 3.5cm wide. There is also a second waist dart half way between the main waist dart and the front edge. The length is 8-9cm and 3/4cm wide. No darts are required along the top of the front edge of the panel down to the waistline for a normal figure. There is another dart around the cut over the pocket. There is a 1.5cm hollowing in the shoulder, to give the shoulder joint extra room, and is necessary to achieve a modern line. 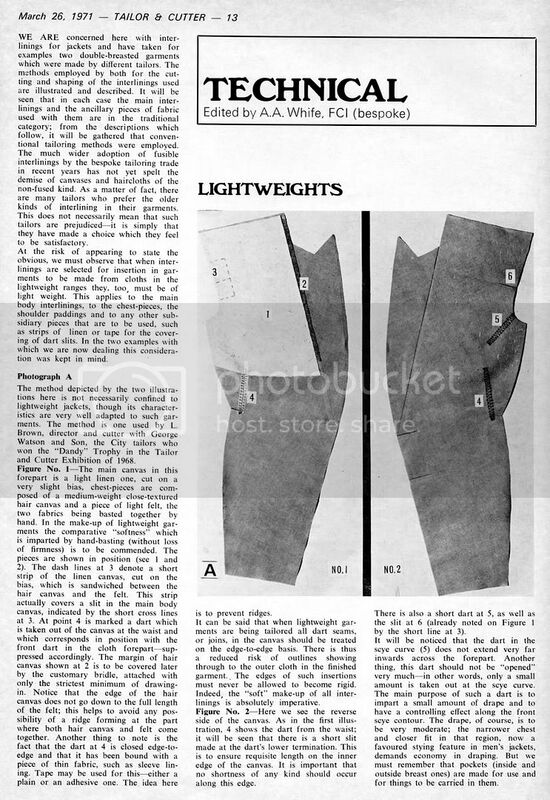 The author suggests that as it is too time consuming to cut a canvas pattern for every coat, for chest sizes 100-110-120cm stock patterns can be cut, although the height of the pocket may need adjustment for individual figures. The chest form depends on the size and position of the darts, and these must be adjusted to the individual figure. Wide darts create excessive fullness in one spot. Narrower and pointed darts spread fullness more evenly. By having multiple darts rather than one large one the fullness is also more evenly distributed. The type of canvas material is also important. A soft woollen canvas may do almost nothing unless the location and form of the darts is carefully considered. Here there is a separately cut-on shoulder piece. From the Bunka men's coatmaking book (2010) available only in Japanese. 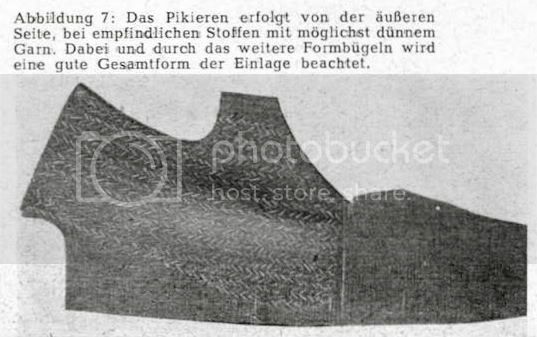 Tailor and Cutter canvasses provide a dramatic contrast to Rundschau cuts. The comes from circa 1950 with Philip Dellafera at The Tailor & Cutter. His canvas cut on the straight is quite classical and similar to that adopted by many modern tailors all over the world. Many will argue that the Dellafera canvas plan is the most uncomplicated and middle of the road of all the cuts shown in this thread. 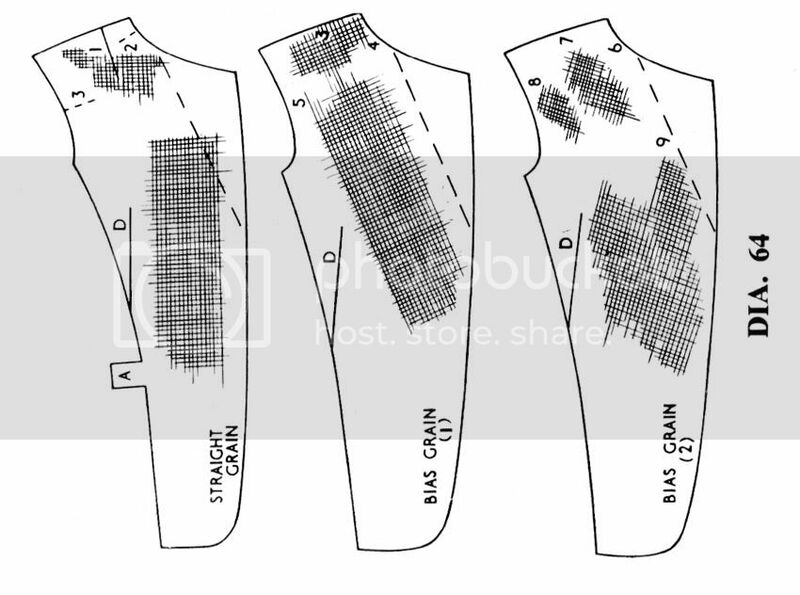 However, many modern tailors will add a layer of shoulder support either of linen or wool body or chest canvas (usually on the bias, cross grain of chest canvas pointing to the shoulder point). These days, it is uncommon to see the shoulder support extend around to the armscye. Edges of chest canvas are usually also bound with bias strips of silesia or lining to stop the horse hair protruding out and scratching the wearer. The reason for this stretching is to produce a hollow shoulder, and also to provide room for the shoulder bone, which usually protrudes above the shoulder. Care should always be taken to avoid cuts in the different layers of cloth, body canvas and chest canvas from overlapping. Otherwise, you will get areas of excess thickness and stiffness building up. This is also true around the edges of layers of canvas. One layer should be trimmed so that the edge is a little bit further in from the layer below it to avoid thick ridges from forming. Note the hollowing at the front of armscye and front of shoulder and neck area. 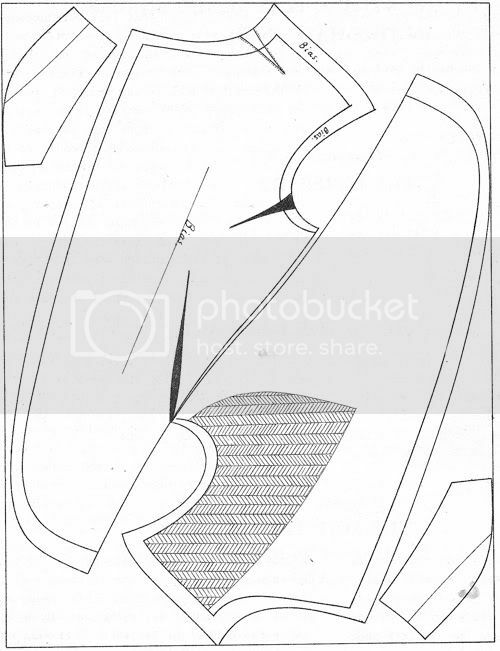 The front of armscye is then stretched, which will cause the cut at the armscye to open up. 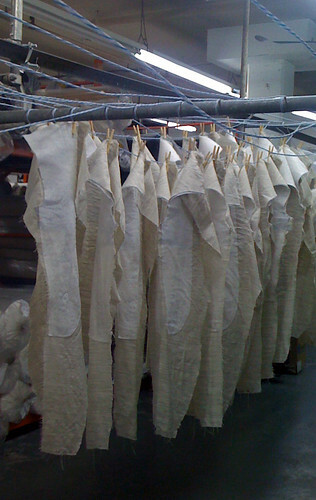 Once the stretching is completed, the front of armscye can the be pad stitched to preserve the shape infused by the iron. The armscye cut (to be opened up) that Dellafera shows is actually unnecessary on the body canvas, and can just be placed into the chest canvas. The reason is because it is possible to replace the cut here with ironwork. Chest canvas does not respond well to the iron, whereas body canvas does. A cut is really only necessary at the armscye of the body canvas if a larger amount of stretching to square the shoulder and to produce extra length for the shoulder bone is desired. In general, the same method of ironwork should be applied to the canvas as that applied to the coat. 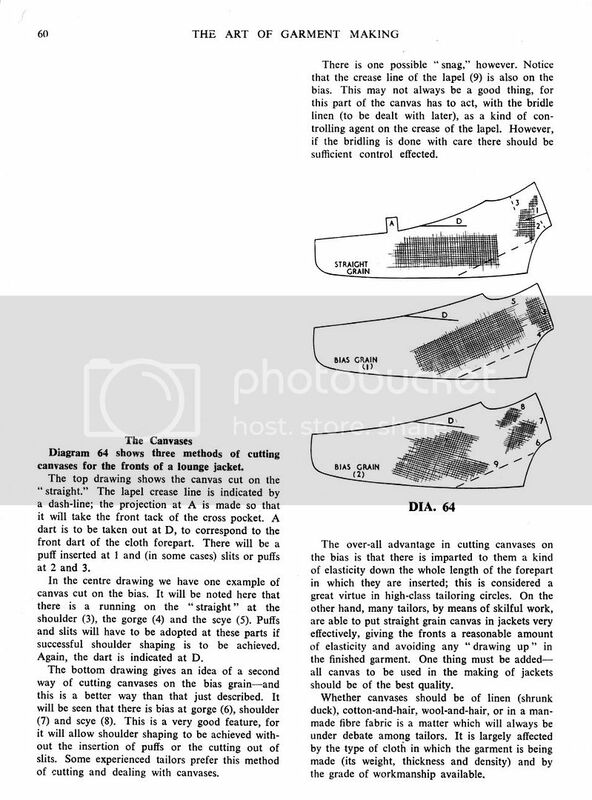 In the 1949 MTOC Whife explains more clearly that the reason for cutting on the bias was to eliminate as many cuts as possible in order to avoid weakening the canvas. When there is bias at the shoulder, this allows extra length to be introduced here for the collar bone by stretching at the shoulder to produce a hollow. That is to say, cutting canvas on the bias is a method of replacing cuts in the canvas with ironwork. 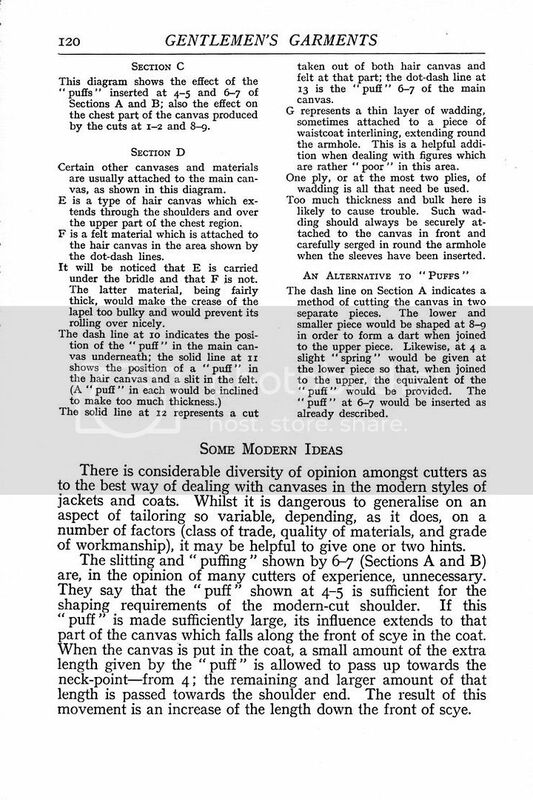 However, not all tailors agree that cutting canvas on the bias is a good idea. Obviously, Whife and Dellafera disagreed on this issue. One of the objections is that the canvas will fail to provide sufficient support or stretch and loses its shape. Others will argue that having modern canvas on the bias makes it easier to iron out any bubbles that form - modern cloths will show even the slightest unevenness in a canvas. Notice the figure on the right shows the grain of the canvas (Abb. 1412). Part of the canvas is cut on the straight grain and another on the bias. For more information on cutting the panelled canvas see this thread. The problem with this is that on modern cloths there is the danger that the cuts will be visible through to the right side of the coat. The application of a strip of fusible will help to prevent large cuts in a canvas showing from the outside of the coat. A rationale is not given for this. 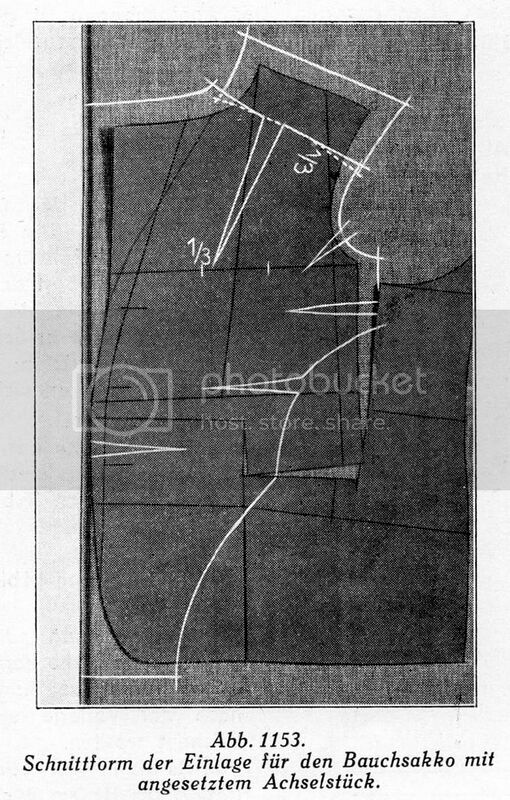 Remember that while the canvas must be convex or round over the breast, it must be made concave in the hollow of the shoulder seam. 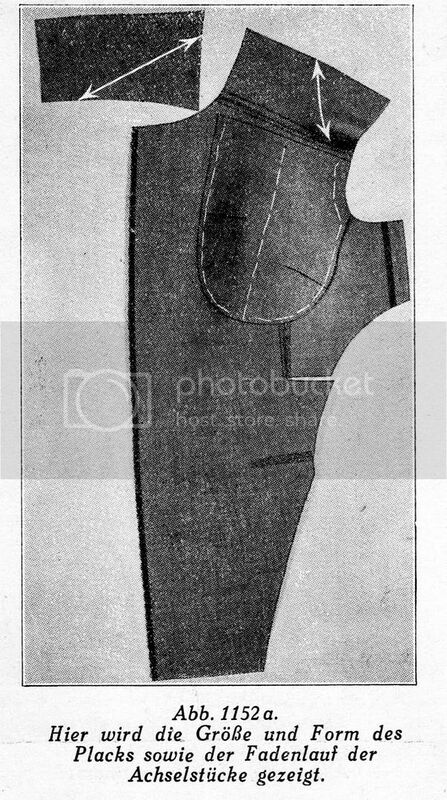 Hollowness of the shoulder section is obtained by cutting down through the centre of the shoulder from its top to a depth of about 4 in., and inserting a wedge or V. This wedge, which is cut out of haircloth, is placed between the canvas and haircloth and is sewn to open the shoulder cut 1 in. wide. Its function is to provide room for the large shoulder bone. 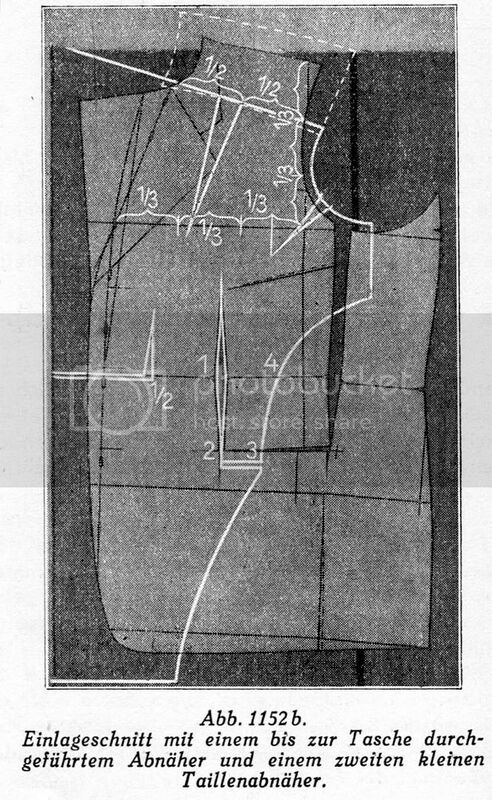 ... while the canvas must be convex or round over the breast, it must be made concave in the hollow of the shoulder seam. Notice the cuts at 4 and 11 o'clock. These are closed, rather than being opened up, to produce the convex roundedness of the chest. His method of cutting a fish shaped front dart that is not cut through to the edge of the canvas should be avoided as this produces too much distortion. Of interest here, is the horizontal dart at letter A that in conjunction with the dart at C, which is preferable to the fish shaped front dart shown by Cabrera, as it helps to reduce distortion. This brings us to the issue of cutting the canvas on the straight grain vs. cutting on the bias vs. cutting on the cross grain. Unfortunately most texts, such as Poulin and Regal's, just say to cut both canvas and chest piece on the bias but leave it at that without explaining it any further. One text (quoted in Doyle - source unclear), interestingly, says that when cut on the straight grain (section A), the canvas gives a more severe, firm finish to the front. 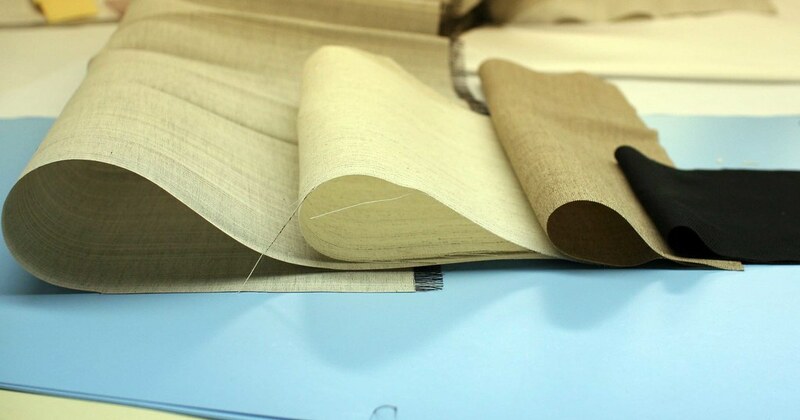 By contrast, a canvas cut on the cross grain (section B) results in a "more flexible and softer finish, often used in sports jackets and in women's canvases", but that it will require a strip of linen cut on the straight grain to be placed along the front edge to support buttons and holes. Large darts can disturb the balance of a coat. For a discussion on the impact of darts on balance see this thread. This is a translation from an article previous posted elsewhere by Schneidergott. I assume they are from circa 1960-70s editions of Rundschau. In particular note the technique of cutting along the weft of the chest canvas. The cut is then allowed to cross over to form a dart. 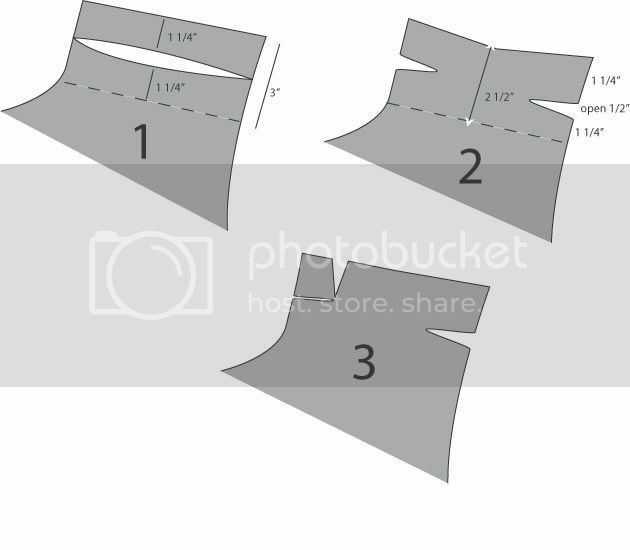 This avoids cutting a wedge shapes segment out of the chest canvas. 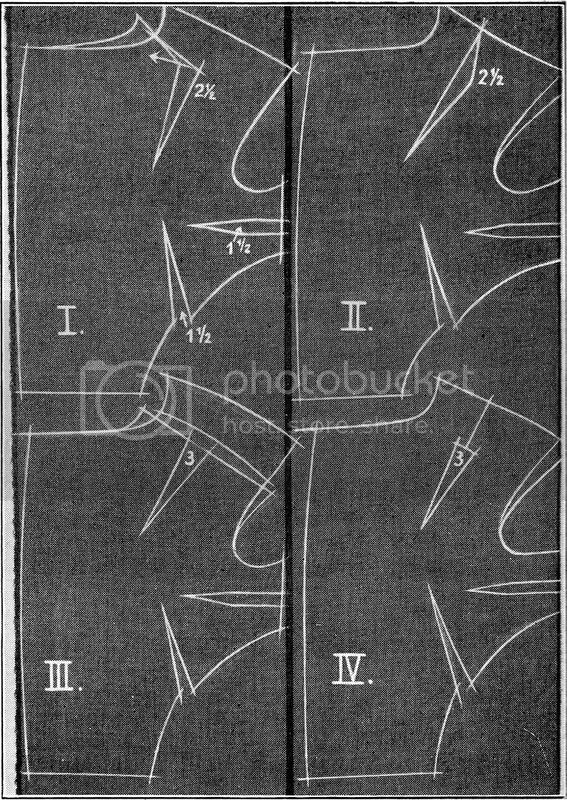 The advantage of this is that it places the cut directly along the weft where the horse hairs run, and avoids cutting the horse horse, as would occurs if the cuts were on the straight or bias. Observe how the arrowed lines shows the maximal spring of the hair in the cloth [along the weft/crossgrain]. You can see that they run in the opposite direction for the intermediate layer and the chest piece so as to give the area around the armscye extra support. 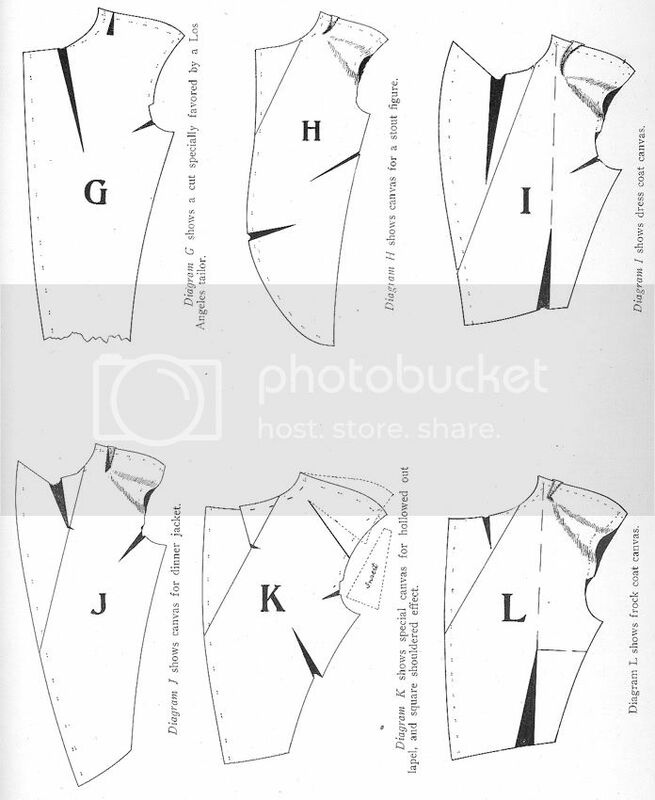 The intermediate layer also covers over the cuts made in the chest piece at neck seam and armscye. The fullness of chest sits somewhat forward of the canvas. 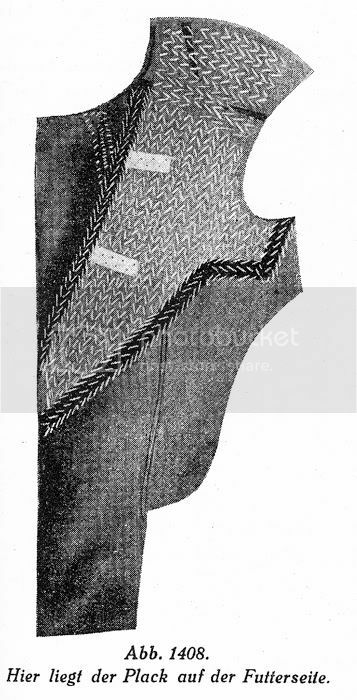 The cut in the neck seam is shown. It is covered over by the intermediate layer, the spring of which is placed so as to optimally hold it closed. Notice too that the cuts in the chest piece are made to run exactly along the woof. This is so that you don't cut through as many of the horse hairs running in the woof, as this will weaken the chest canvas. 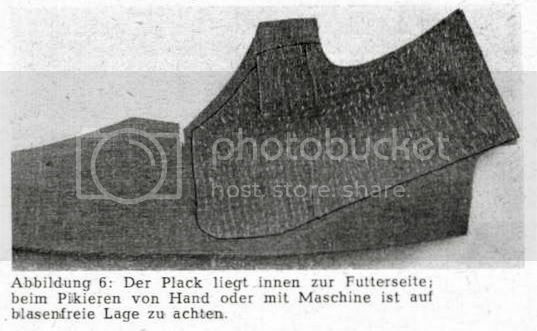 Here is yet another instalment from Schneidergott's collection of Rundschau journal articles. 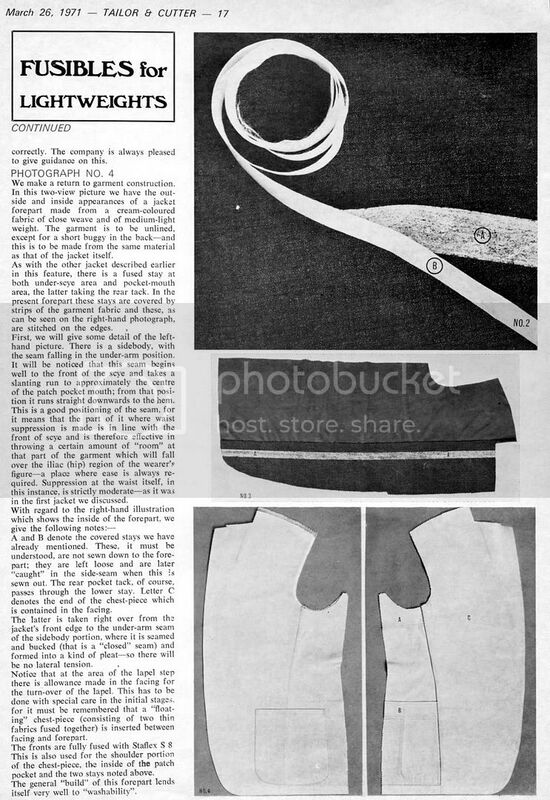 This appears to be a 1960s article when the fashion for omitting cuts from the shoulder was widespread in the German literature. 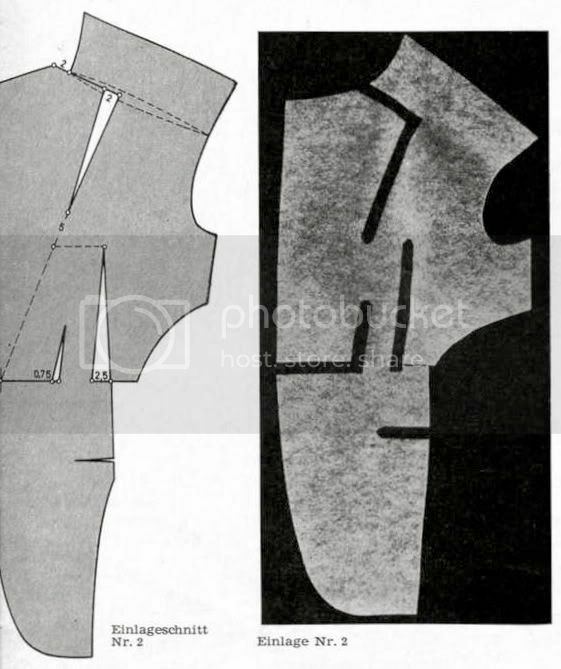 Notice the way they advise against an excessive number of cuts in the canvas and they have given up the older practice of cuts inserted around the shoulder to hollow it out, preferring the softer look that this results in. 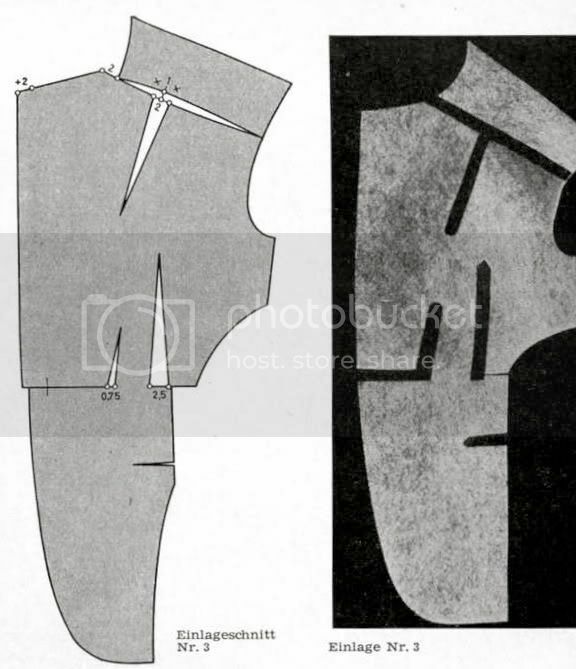 Note too how in this article the chest piece has been cut so it is oriented with the straight grain sitting vertically as it lies on the canvas. 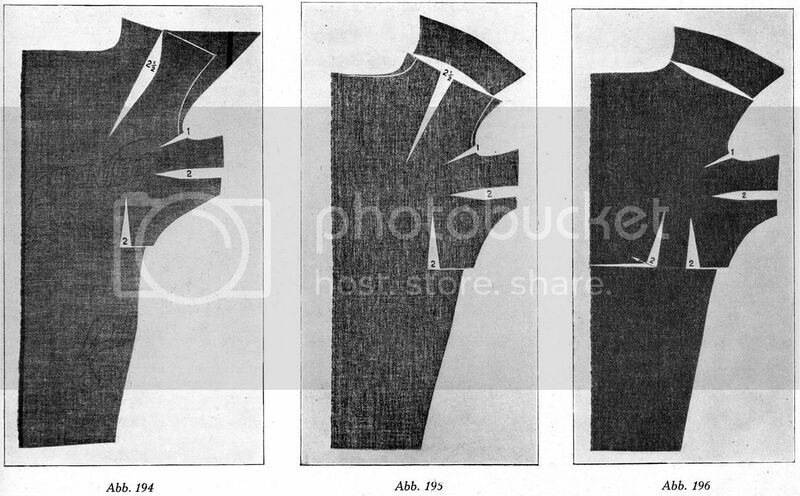 Compare this with methods in which the chest piece is cut so as to sit on the bias once placed on the canvas. The canvas helps to maintain the shape and form of the coat. On modern styled coats the canvas should be soft and supple rather than being like a coat of armour. This makes it important that the canvas cloth match that of the coat in its weight and strength. 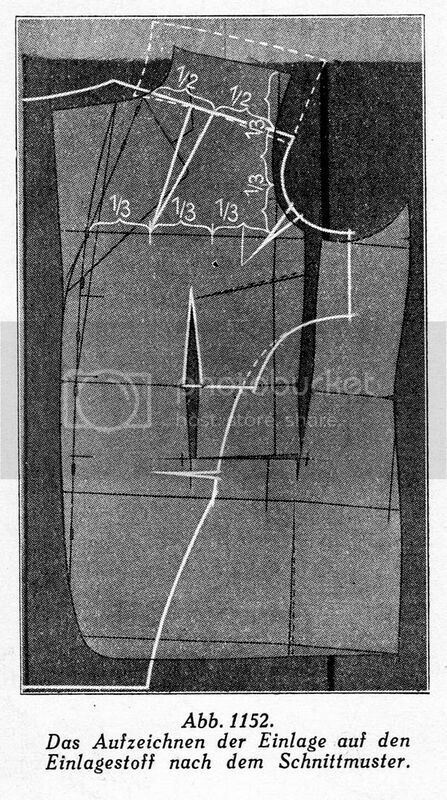 The canvas should be worked up to follow the shape of the wearer's figure as well as the dart placements on the coat. 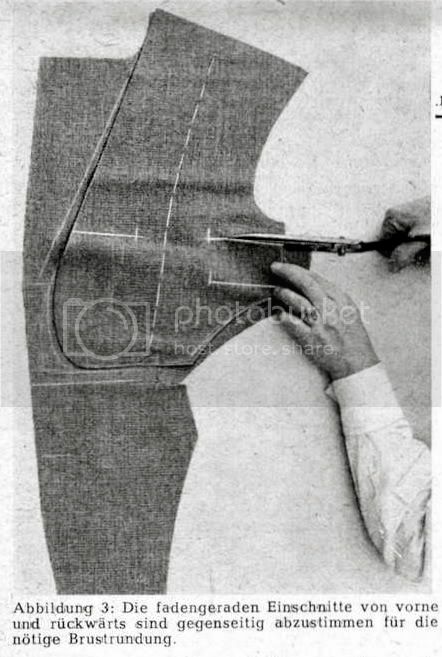 The dart is sewn together using a piece of lining cut on the bias - preferably thin sleeve lining to allow the dart edges to be cleanly opposed. 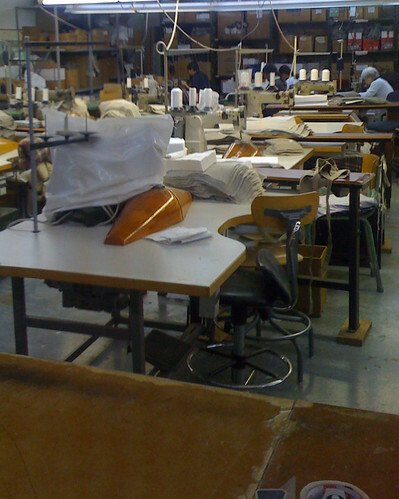 The dart is then secured using a normal sewing machine or a zig zag stitch machine. It is then pressed flat using a pleater (wooden block). A second line of basting is placed along the length of the armscye. The chest piece is then basted again lengthwise onto the canvas. The chest piece can now be pad stitched either by hand or machine. In either case it must be clean and free of bubbles. For that the canvas must be padded from the outer edge with stitches that are not too fine, allowing canvas and chest piece to be rolled in the fingers. With delicate materials a fine yarn must be used. The former practice of infusing hollowness into the shoulder with cuts or darts has gone out of favour, as in modern men's tailor a softer, more lightly flowing shoulder is now favoured over a more upholstered look. For a discussion on installing canvas see this thread. Here is a twin- needle jumpstitch machine used to pad canvas fronts. 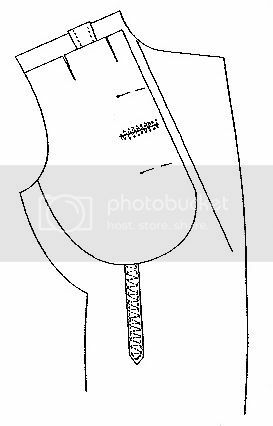 The number of stitches and their proximity is controlled in real time by the operator so a lot of tight stitching can be laced for firm support, or few, loosely spaced stitching can be placed for softer constructions. The wooden form is used to build the shape in the chest and shoulder as the different layers are worked up. After the fronts dry they are pressed on a machine which has been shaped expressly for this- it maintains the shape of the chest and shoulder, and stretches the front scye. Here are three different types of canvas, with the fourth item (black) being fusible. We can appreciate here the advantage that hair canvas provides over fusible. The material third from the left is wool canvas; is is made from a blend of wool and a little cotton, with horse mane fibers woven into the weft. The mane is softer than the tail, and this provides softness in the warp and dimensional support to the weft; this material is used for the full front. These days, the hairline (direction of the hair) is cut to run across the coat. This type of canvas is usually sold in 60" widths. Second from the left is what is called a "wrapped hair canvas". Every other pick (weft yarn) is horse hair which has been wrapped in cotton; the horse hair itself (staple) is not very long so the fibers are wrapped in order to get a longer yarn and to provide some bulk. This medium- weight canvas is usually used in the chest and varies from 12 to 16 picks per inch, with the greater number of picks providing more firmness, and is generally sold in 60" widths. The article on the left is haircloth. Every pick (weft yarn) is horse tail which is much firmer than horse mane. Because of this, and the fact that the hairs are of limited length, this is only sold in 36" widths and is much more expensive than wrapped canvas. 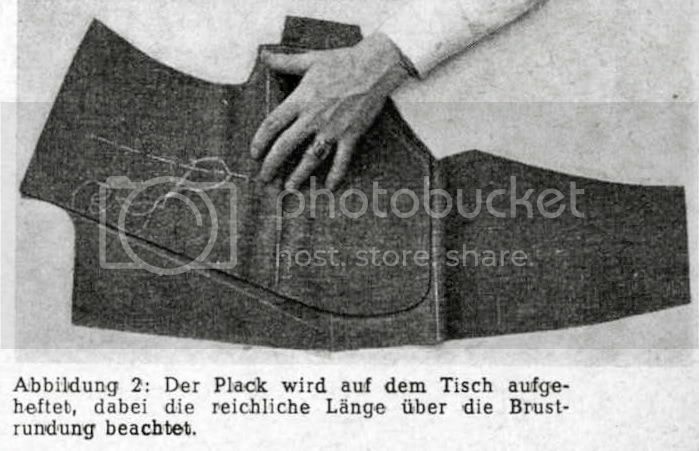 It is generally sold in 18 to 21 picks per inch, and is most often used in the shoulder (though Canali, Samuelsohn, and some other makers use it in the chest as well). Cut on a partial bias with the hair line running up toward the shoulder point, this helps eliminate "cigars" or those folds in the hollow that one of Sator's sources mentioned. You can see the horse tail hairs sticking out at the selvedge. If this is not properly covered it can stick out of the chest- people who have complained about "plasticy fibers" that are quite rigid and uncomfortable are experiencing migration of the haircloth. Not really much to add here, since there seems to be a common sense about how to make a good canvas construction. You can see the different cuts in the canvas to shape the belly. b) to reduce cuts in the canvas to keep it's springiness. When I was in Paris several weeks ago, I interviewed Jean-Pierre who had been the head of the Saint Laurent tailoring workrooms. One of the items we discussed was the hollow shoulder. J-P told me that YSL liked the hollow shoulder and they sometimes slashed the shoulder and added a wedge. This I had already learned from the inside of a YSL jacket I own. 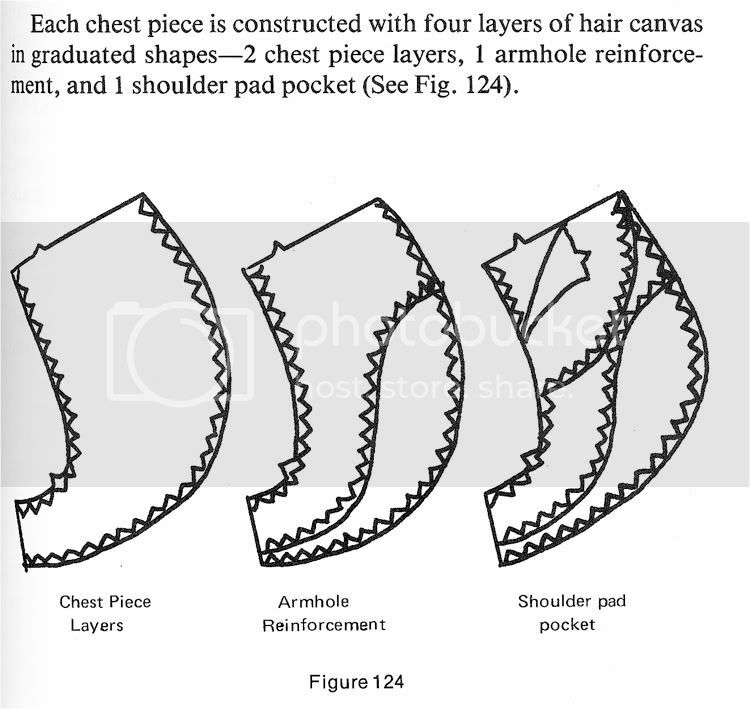 What I didn't know was that they cut the canvas for the shoulder pads in two sections with a seam at the center--more or less perpendicular to the shoulder seam. 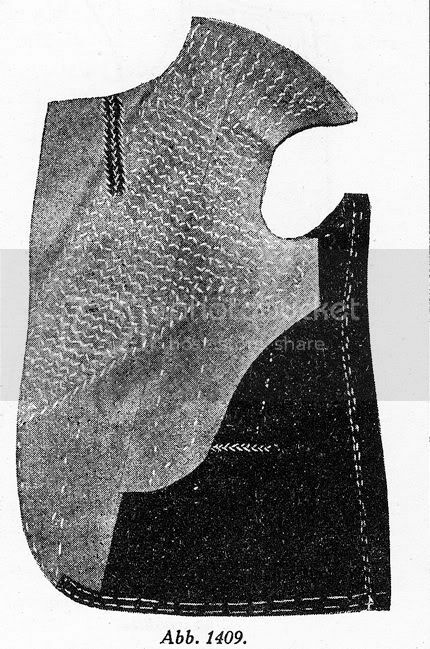 The shoulder pad seam (like 2 facing shallow"C"s)created a hollow on the pad itself; then it was padded with cotton. The canvas in the YSL couture suits is cut on the bias and many suits include it in the entire jacket body. 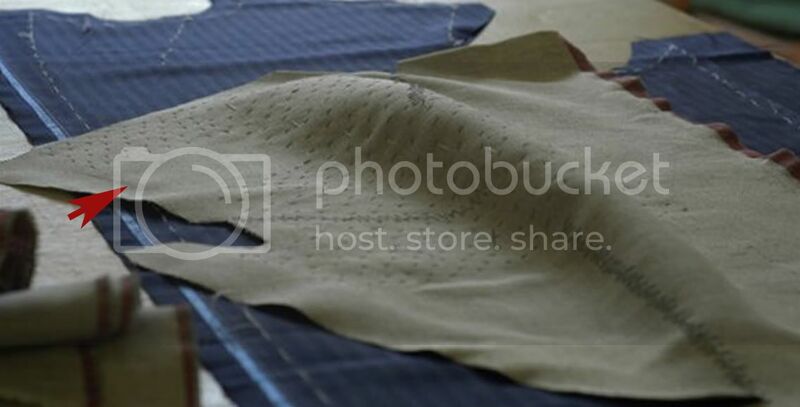 There is a forum for discussing issues specific to women's tailoring. I hope to write a bit more there to kick start the discussion. Women's coats often have canvassing in the sleeve head and the upper parts of the back panels too. Underlying is used too if a particularly light cloth has been chosen - this I learned from your excellent book on couture sewing techniques. I think that certain subjects, like canvas construction, should not necessarily be splintered by gender, just to make it easier to keep up with them. It was Armani's blurring of the tailoring gender lines that contributed to his revolution of RTW. Momentary thread hijack- I saw the YSL retrospective recently and was blown away by it. They must have thought I was some kind of nut since I spent most of the time crouched down and lying on the ground trying to look up the couture skirts! The amount of thought, time, and work that went into these pieces of art which would have been completely lost on all but the most informed was just astounding! There is a forum for discussing issues specific to women's tailoring. I hope to write a bit more there to kick start the discussion. Women's coats often have canvassing in the sleeve head and the upper parts of the back panels too. RTW coats also have canvas in the sleeve head. The old-fashioned sleeve head wadding that we used to buy on rolls has been largely replaced by shaped sleeve heads, designed specifically for the type of shoulder desired. I'll create a thread on sleeve wadding tomorrow. The following comes from die Zuschneidekunst VI, 1938. 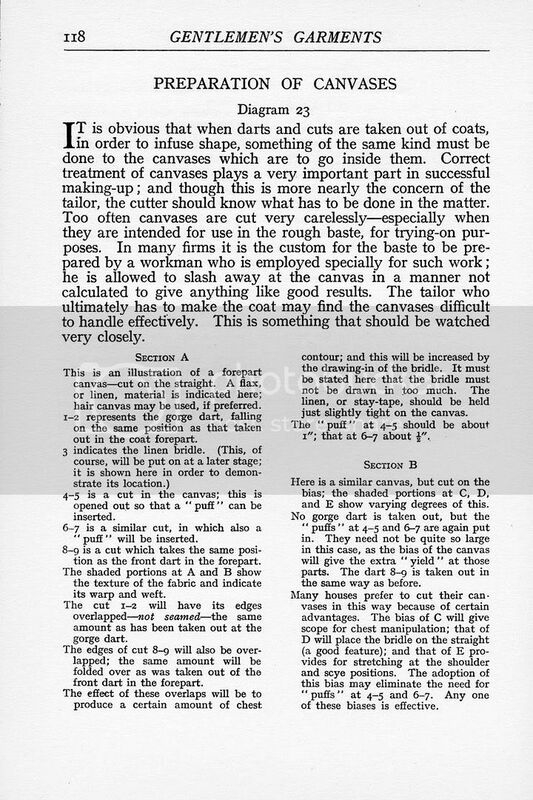 It is an review of overcoat canvas construction. 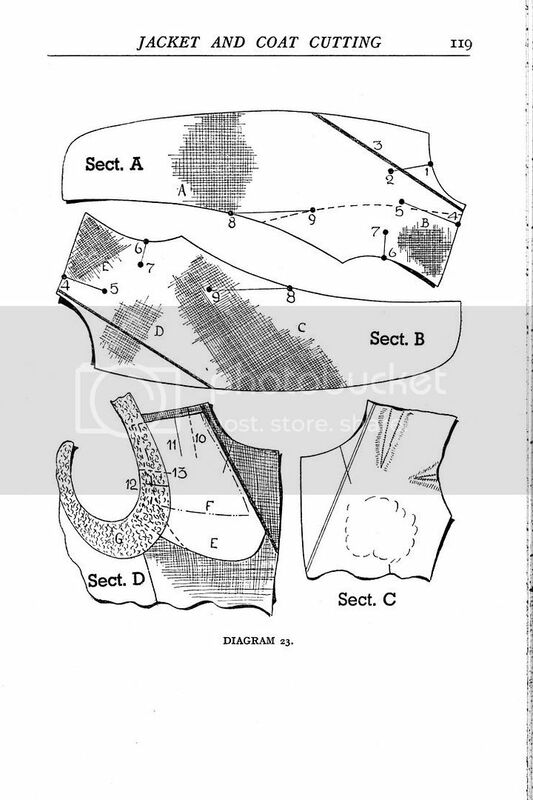 The first diagram is of a canvas with a cut on shoulder piece. The width of the shoulder piece is height of 1/3rd of the vertical height of the front of scye. 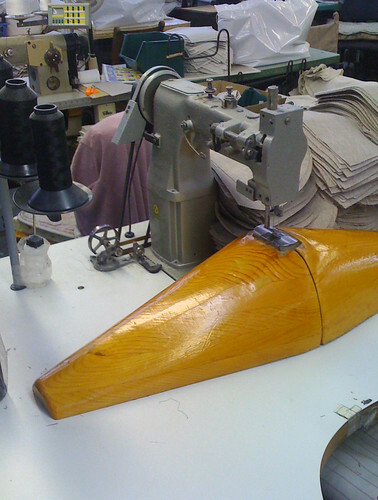 The seam has a hollowing of 1-1.5cm depending on the shape of the shoulders. The upper chest dart starts half way along the shoulder and ends at the front third of the width of the chest. The front dart lies half way along the panel. The small armscye dart lies a little above the construction line for the depth of scye. Depending on the desired fullness of chest the darts sizes recommended are: upper shoulder 2.5-3cm, waist 1.5-2cm, armscye 1-1.5cm. To maintain the straight fall of the foreparts it is advisable to open a 0.75-1cm dart under the side pocket. 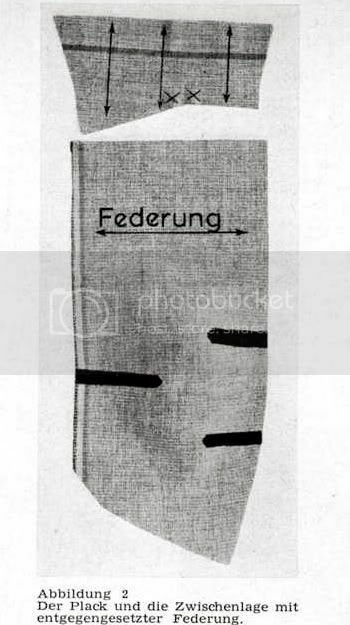 Also from die Zuschneidekunst VI (1938) come the following canvas patterns for a lounge coat. The size of the shoulder dart is 2.5-3cm depending on the prominence of the chest. The front waist dart size and location is dependent on front dart on the coat pattern. The canvas dart size can be the same as, or a little larger than that of the coat. 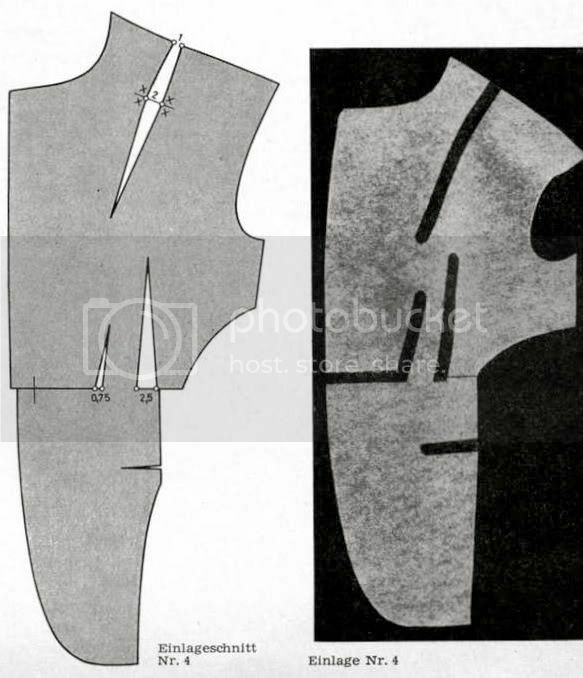 The arrows show the direction of maximal spring of shoulder support piece and cut-on section of canvas at shoulder. The armscye dart is placed at the deepest hollow of the armscye, and end at the line of the back third of the width of chest. The size of dart is around 1.5cm. 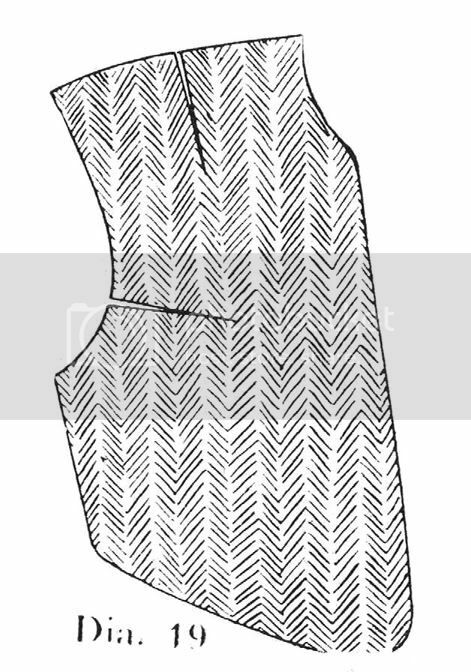 Notice how in this particular pattern, an alternative strategy to the cut-on shoulder is shown. Now here is something extraordinary - an article edited by Archibald Whife on canvas construction from as recently as 1971. 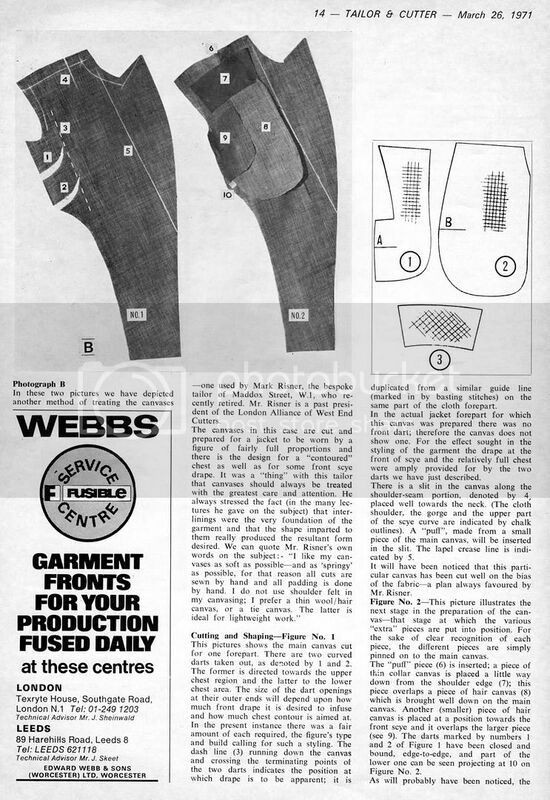 This appeared in the March 26, 1971 issue of The Tailor and Cutter. I had no idea that his career as chief technical editor there had continued for so long. 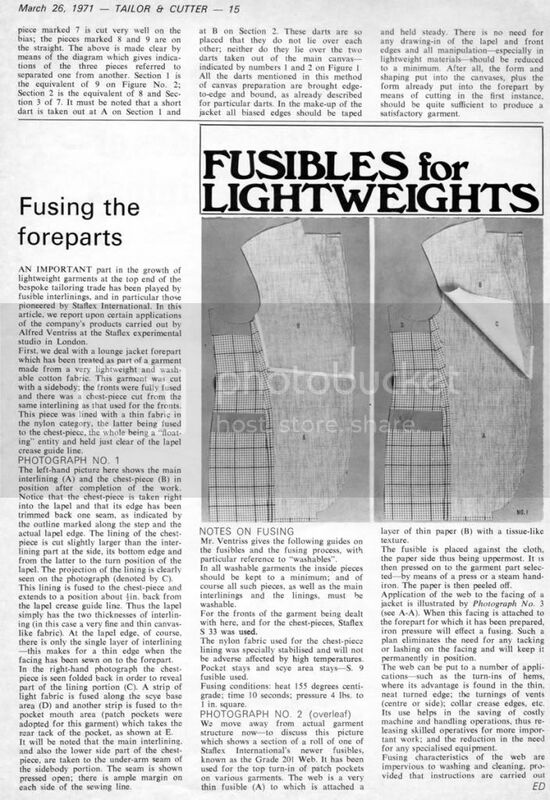 The section on fusing suggests that this is not a reprint of an earlier article but one that was written for that edition. This last one, for the German methods, seems more reasonable. I think to many cuts can be a problem. They break up the continuity of the canvas. Pad stitching shape is better than to many cuts. 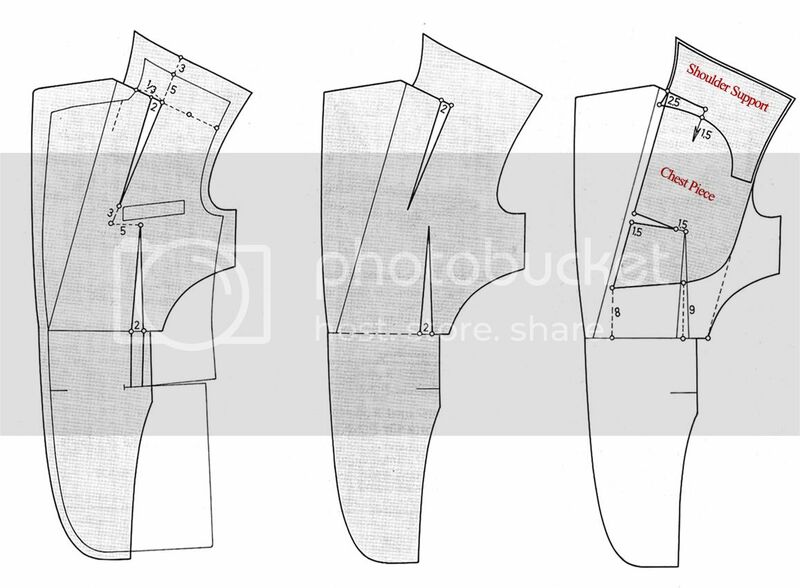 Perhaps with to many cuts pad stitching shape is more important to bring back the continuity. Lots of cuts in a canvas just makes floppery. Surprised there is no cut for the shoulder bone. That is, minus the second cut at the waist. The hollow is placed in the shoulder only after passing beyond the clavicle. You can also compensate for the weakness introduced by the cut-on shoulder through supports in the form of one or more extra layers of haircloth shoulder reinforcement. 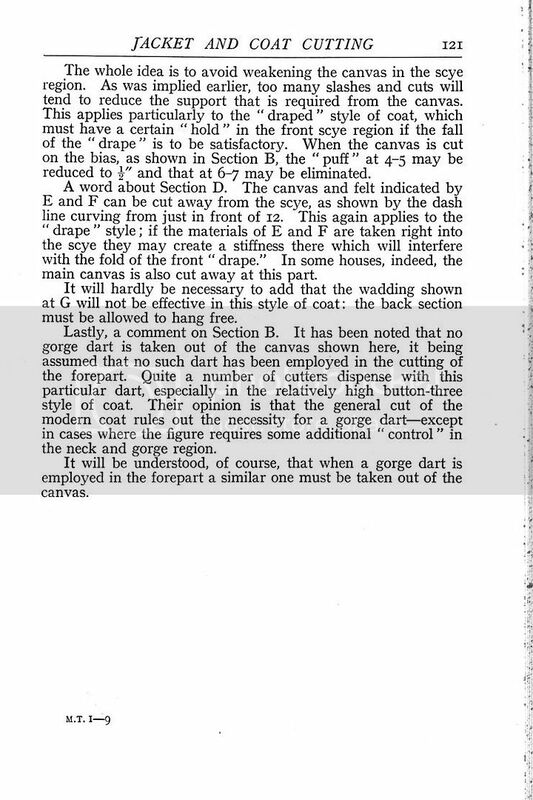 If a gorge dart is to be used in the canvas, it stands to reason that the coat itself must also have one. But, as I have said, there is seldom a need for the gorge dart if the other two darts are used together. 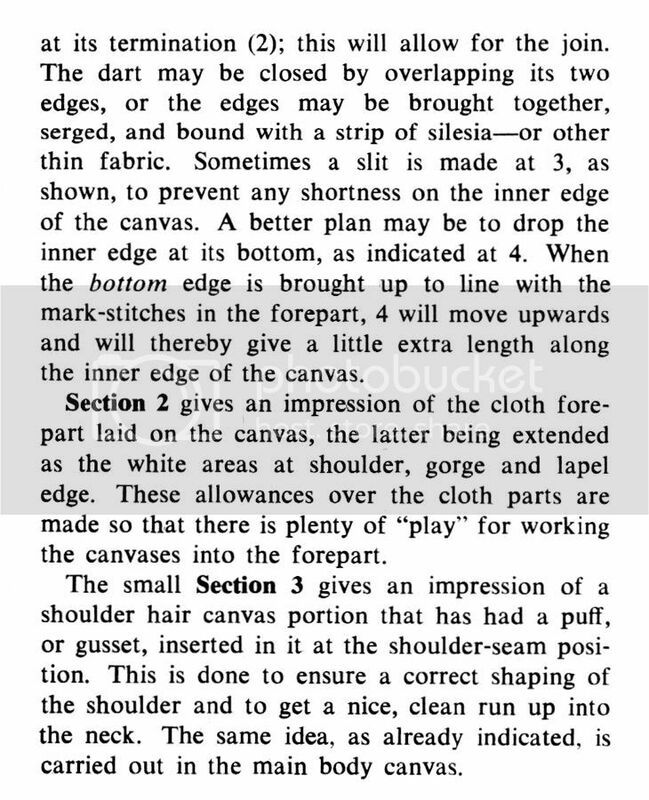 The Schneidermeister writers take particular pains to tell you to avoid cuts in the canvas from the neck seam-gorge-front of chest such as that shown at point B in Fig 24). The reason is that they think that this straightens the neck point too much and starts to impinge on the balance of the coat. I was saving this until the cloth came in, but you have forced my hand. Thanks for "forcing" him, Sator! I've been waiting for those instructions quite a while! I find that the amount of prominence and hollow in the shoulder/clavicle area is subject to a lot of individual variability. It is also a complex shape, and trying to follow such complexity with darts is very hard - you as say. 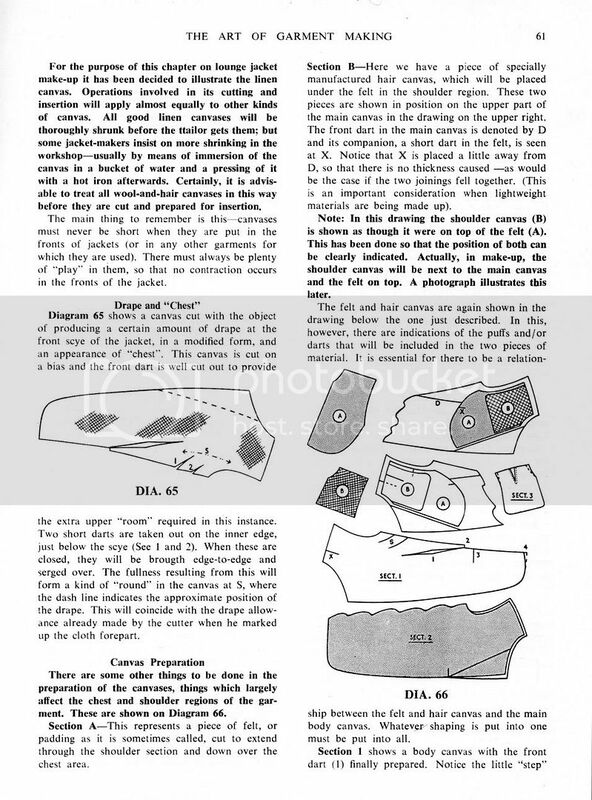 However, for a concave shoulder, I would have thought the cut-on shoulder would help to enhance the concavity by the way it introduces shortness in the middle and lengths at the ends? By introducing a third layer of chest cloth, any weakness introduced by the cut would be rendered largely negligible. 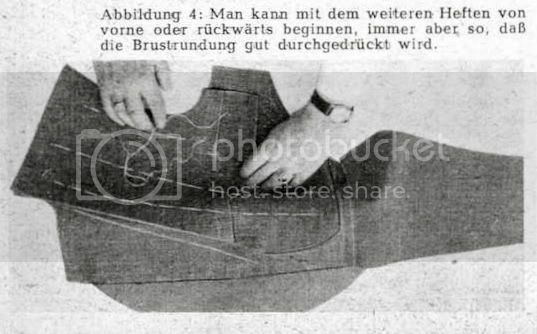 As far as the age of these styles of cuts, Poulin published in the 1950s, and you can find Rundschau canvas patterns from the 1960s with cut-on shoulder pieces. I also wouldn't call a chest darted to be full, "draped". Darting the chest full is something older than drape, which was meant to be a way of cutting a full chest without having to do a lot of complex working up with darts and ironwork - it's meant to be a shortcut way of cutting a full chest. The cut-on shoulder is exactly the same effect as having a vee in the roll line of the shoulder and stretching the scye (or having another vee), but instead of taking fabric out in the middle, you are "adding" it to each end by spreading the vees, except in this latter method there is no seam to weaken it. I'm a believer in the gorge cut, which is another thing entirely, but having the vee extend down the chest is problematic in my experience. As I wrote, my method provides the same amount of hollowness without the seam, and keeping the chest tight and close. 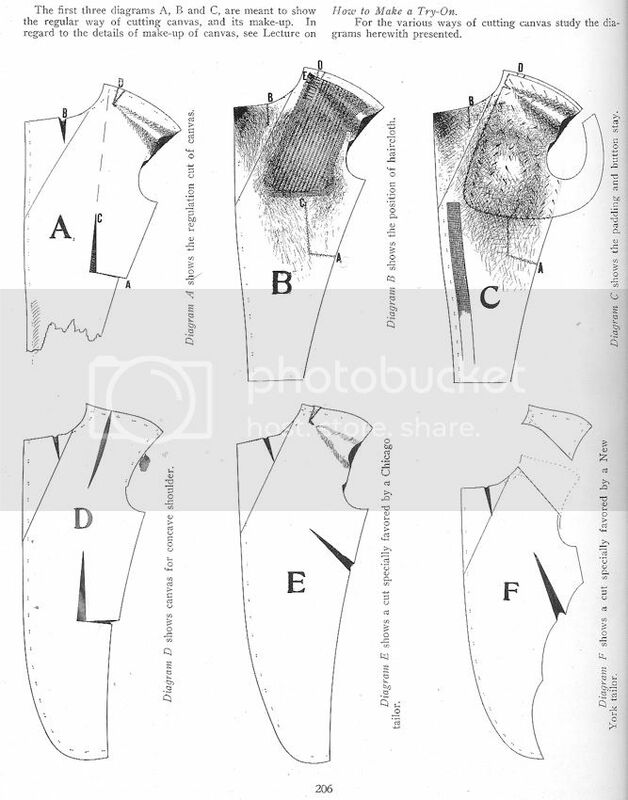 IN diagram 1 you see the "cut on" shoulder piece. Diagram 2 shows how the vees are the equivalent to this piece. The thirds diagram shows the roll line vee being transfered to the shoulder (basic dart transference). I don't know anybody who uses a cut on shoulder anymore.